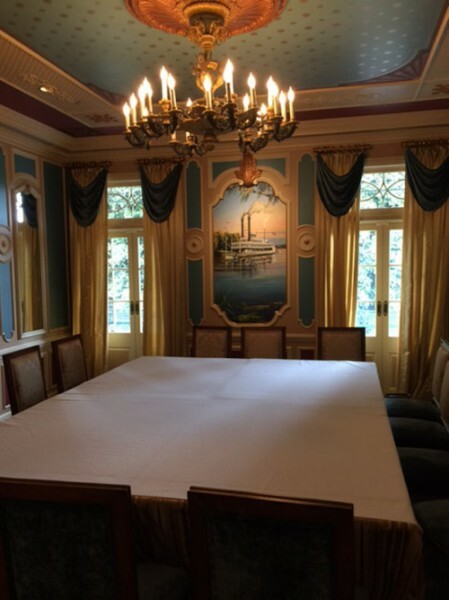 Update 11/28/15: Almost one year ago, we shared the news that the new Club 33 dining room would offer unique experiences to non club members (see full story below). Now, I am here to tell you that these experiences are beginning to finally be rolled out. Club 33 members recently received information on the newly announced experiences for the general public. Up until this point, the room has only played host to Club 33 Members and top-level Disney executives. 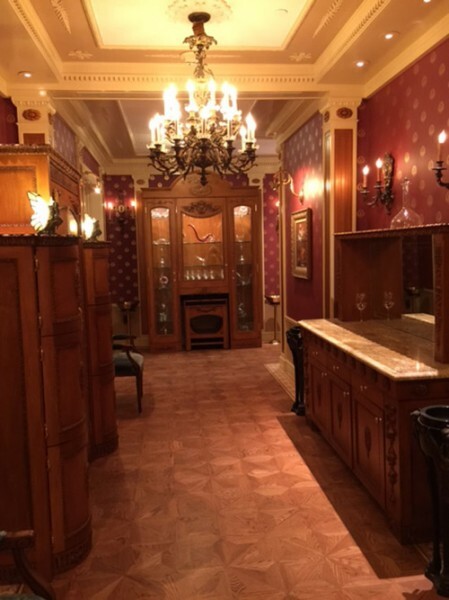 The first package will include access to the exclusive Club 33 Le Salon Nouveau before the meal and a five-course dining experience inside the new 21 Royal Street dining room. The second package includes the use of the Disneyland Dream Suite. Cocktails and after dinner coffee will be served on the balcony of the suite. No starting date for the new experience has been confirmed. This dining room is still a part of Club 33, and as such, members of the club have first choice for dates and evenings. Eventually the public will be offered the opportunity to book the room nights that have not already been reserved by members. I was sent photos of the new dining room five months ago anonymously. I have been waiting for this confirmation to share them. 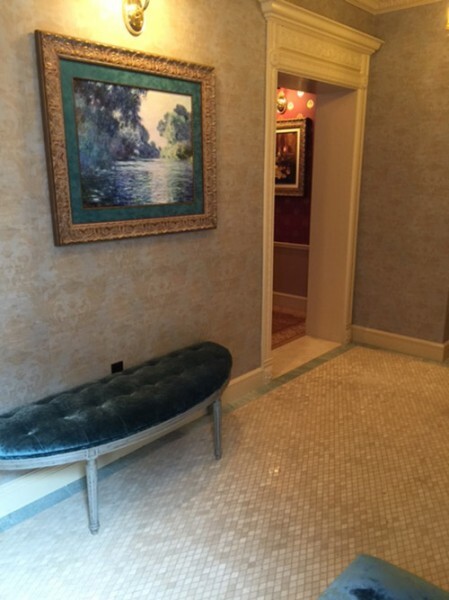 This is the entry way sitting room that is located at the top of the stairs when you first enter 21 Royal Street. The dining room features beautiful murals by Disney artist Leslee Turnbull. Here the Haunted Mansion is painted to appear before it became haunted. Just off of the main dining room. Update: Disneyland Public Relations has officially reached out to Disney Dose to fully explain the unclear letter Club 33 members received. The 21 Royal Street location will open as a private dining room requiring advanced reservations. 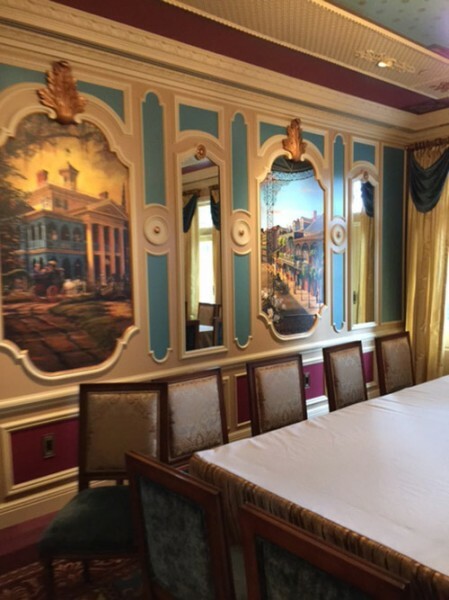 Club 33 members will have priority to book the room, but in the future park guests may be able to make reservations. This space can seat to 16 people. Disney has confirmed that the Royal Courtyard construction is for this project and the Disney Dream Suite will not be impacted. Disneyland has built a new dining room above New Orleans Square adjacent to the private membership Club 33. But, unlike the club, this new restaurant will be open to the general public. The currently unnamed restaurant will rival the award winning Napa Rose in the Grand Californian and the Victoria and Albert Restaurant in Walt Disney World. This is the first time that alcohol has been served outside of Club 33 in Disneyland during regular operating hours. That’s huge news! That info alone should make you want to share this article, but we are just getting started. Club 33 members have received letters confirming this rumored new restaurant. 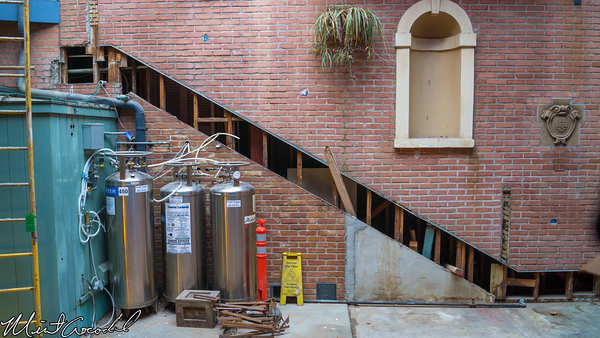 For the last two months, the Royal Courtyard located at 21 Royal Street has been under construction with scaffolds covering the stairway. This will be the new entrance to high end restaurant. For the last ten or more years, the courtyard has been used strictly for merchandise overflow from the Pirates of the Caribbean souvenir shop. This the outside of the new restaurant located at 21 Royal Street in Disneyland. The photo comes from Disneyland update provider, Mint Crocodile. Here’s how the Royal Courtyard looked upon last inspection two weeks ago. Photo by Mint Crocodile. 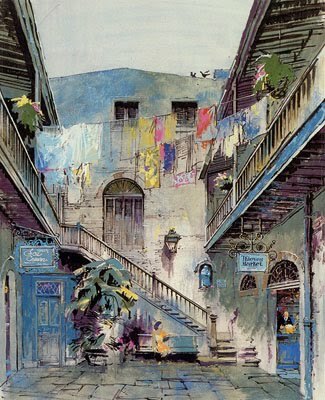 This courtyard is being remade to match the original Herb Ryman artwork, seen below. Once up the stairs, guests will enjoy a beautiful dining room with views out to New Orleans Square as well as access to the Disney Dream Suite courtyard. I remember this courtyard from the time the Disney Gallery occupied the space above the Pirates of the Caribbean. The upstairs dining room is already completed and the reports from those who have seen the space are quite positive. The restaurant will share it’s kitchen with Club 33 and based upon that, you can assume that Andrew Sutton will be the executive chef for this new restaurant as well. 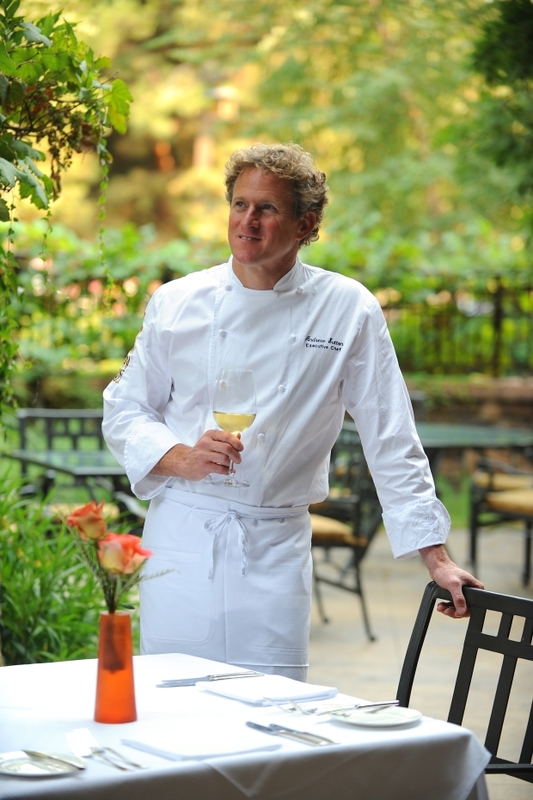 Sutton is currently the executive chef for the Carthay Circle Restaurant, Napa Rose, and Club 33. Seeing as he controls the Club 33 kitchen, I am almost positive that he will be head chef and that we will see an experience similar to the Napa Rose Chef’s Table offered here nightly. The menu is currently quite fluid with no options finalized, but one version shared with me would be a 10+ course meal a la the Napa Valley French Laundry restaurant. Inside the restaurant, Club 33 members will hold special privileges including, reserved seating and top priority for reservations. Club 33 Copycat? Or Are They Copying Carthay Circle Restaurant? 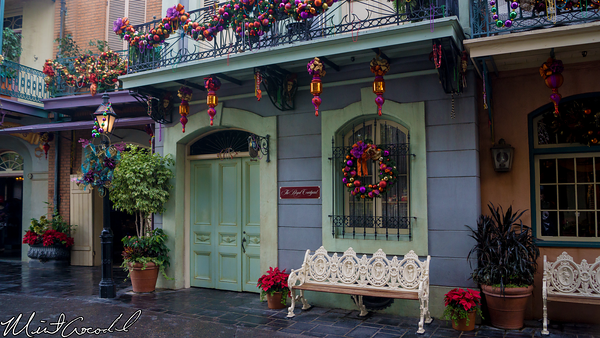 Now, if this restaurant provides fine dining, alcohol, and beautiful views of New Orleans square, what is the difference between this new restaurant and Club 33? This new restaurant will allow someone, such as you or me, to visit Disneyland and decide that rather than paying for a year long membership to a private club, we can pay for one night. But, there is something special about Club 33, that is not achieved by this restaurant, or even by getting the coveted Club 33 reservation from the friend of the friend of the uncle of your dog. Being a Club 33 member makes you a part of a Disney royalty of sorts that provides much more than just access to a restaurant. The special experiences offered specifically to members, such as seating at the Disneyland Candlelight Processional, talks from Disney legends, and the best reserved viewing for World of Color and Fantasmic! make this membership worthwhile. There are Club 33 members who are grumbling about the changes, but I see very few dropping their memberships because of these changes. So, this restaurant will never be able to copy Club 33, but maybe it will copy something else. Last April, Mary Niven, the Vice President in charge of Disney California Adventure was switched over to Disneyland. Niven is the reason the relaunch of Disney California Adventure went off without a hitch. It was Mary Niven who created the FastPass system for World of Color…and now it is in Disneyland. It was Mary Niven who pushed the Carthay Circle Restaurant through the Disney corporate restrictions and was able to create a proper fine dining restaurant in the middle of theme park. And my guess is that it was Mary Niven who wanted to recreate the success of the Carthay Circle Restaurant in Disneyland Park. Now, the big question…when will we see this new restaurant welcoming guests in the parks. The answer to that is quite exciting. This restaurant could open as early as January or February of next year. Are you interested in Disneyland secrets and stories like Club 33, the secrets hidden inside Pirates of the Caribbean, or the super secret “it’s a Small World” doll? 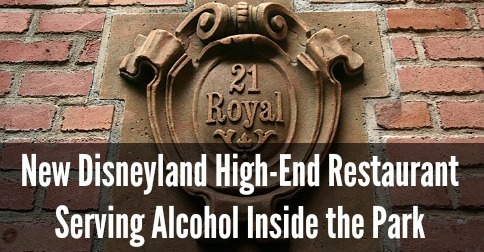 Well you have to check out our Disneyland Secrets eBook. Please share this article by clicking below, Like us on Facebook, and subscribe to our newsletter for more Disneyland breaking news. How do I apply to work in this new restaurant? This article is so wrong I can’t tell if your joking or not. 21 Royal is The Dream Suite. There is a “conference room” there where food is occasionally served. There is no major project going on there. You’re missing a key element here: although the Blue Room will be open to the public, it is available only by advance reservation for private parties up to 15 people… and Club 33 members have priority for the reservations. Thanks for adding a piece to the puzzle Anon. I obtained pictures from inside the rooms I would like to share them here. Please get in touch with me. Another piece of the puzzle missing is that the Le Salon Noveua opportunity is only for club members not for the public. In the documents we received it says “Member Private Dining” when discussing meeting in Le Salon.